I haven’t met too many kids who don’t like Dr. Seuss books. My girls definitely love them. It’s hard to choose a favorite, but One Fish Two Fish Red Fish Blue Fish is definitely on the top of the list. It’s very nonsensical, but great for new readers. 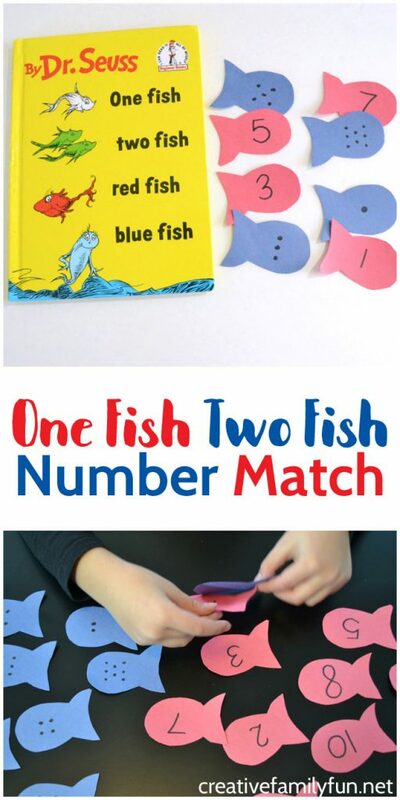 The book is also so much fun for a read aloud, and would work great paired up with a fun math activity, like this One Fish Two Fish Number Match Game. This game is simple to prep and it’s fun math practice for your preschoolers and kindergartners. 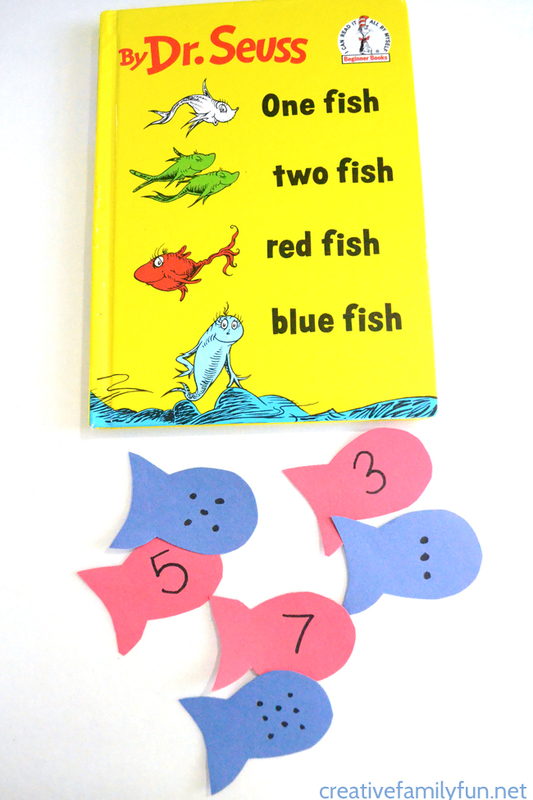 Grab your copy of the book and let’s get started making our One Fish Two Fish Red Fish Blue Fish number match activity! You will need 10 red fish and 10 blue fish. 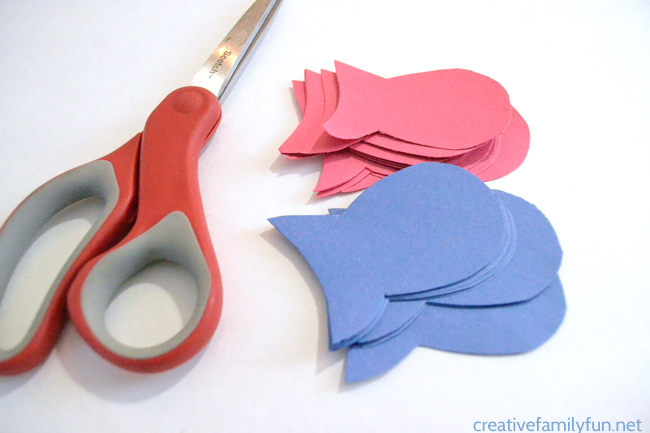 You should be able to get at least 10 fish from each piece of construction paper. To make it more simple, create a simple template for yourself. Cut out one fish and trace it to make the rest of your fish. Once you have your fish cut out, write the numbers 1 through 10 on your red fish. 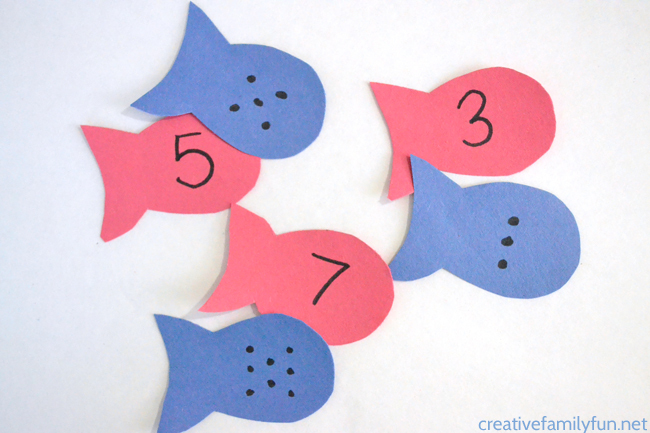 Use dots to represent each of the numbers on your blue fish. Mix up your blue fish, then mix up your red fish. Have your child match each number fish to its corresponding dot fish. Play a memory game. Flip over each of the fish. Take turns choosing fish. Turn over one blue fish and one red fish. Do they match? If not, try again. 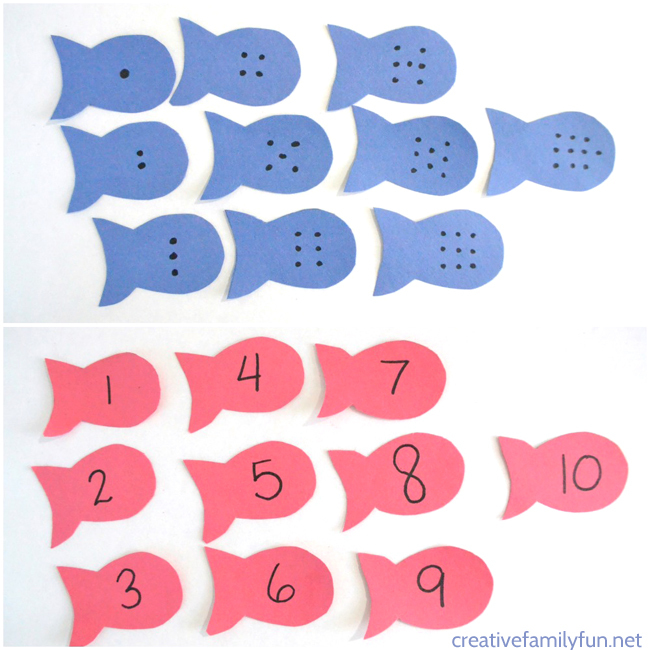 Use the number fish to count small manipulatives (such as mini erasers, coins, or pieces of cereal). Choose a number fish, then count out the correct number of item. Count the dots on the blue fish and say the number out loud. Can you think of other ways to play this One Fish Two Fish number match activity? This game also works well as a simple busy bag. Slip your fish in a basket or bag and it’s ready to play anytime your child needs some number practice. 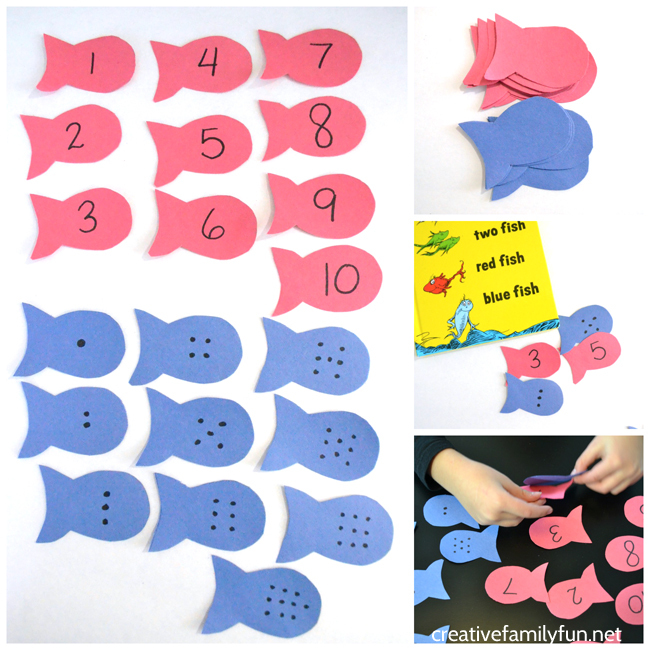 One Fish Two Fish Number Match is easy to prep and fun to play. It’s a great way to practice number and will probably inspire many readings of the book.